Gordon Strachan's Middlesbrough tenure got off to a bad start as Jamie Mackie scored the only goal of the game for strugglers Plymouth. Boro fell behind 19 minutes into the second half, when Mackie slotted past Brad Jones from 12 yards. The hosts should have levelled when Kari Arnason fouled Sean St Ledger in the box, but Adam Johnson drilled the resulting penalty wide. Argyle held on for three points despite seven minutes of stoppage time. Home fans at the Riverside Stadium endured another dismal performance in Strachan's first game in charge, and victory was no less than Plymouth deserved following a spirited display which belied their lowly league position. Argyle had squandered a number of chances by the time Middlesbrough finally managed a meaningful effort of their own in the 38th minute. Mackie then gave the visitors a shock lead as he broke clear before beating Jones with a calm finish. Marcus Bent headed wide from a Julio Arca cross and Gary O'Neil also went close as the Teessiders looked to respond. But the hosts almost conceded a second with 20 minutes remaining when Arnason headed wide from Alan Gow's corner. Arnason was then penalised for bringing down St Ledger in the area, but Johnson missed from the spot. "It was frustrating. It always is when you lose. But it was nice to be back. I enjoyed it, not the game but the experience. "It will take hard work for us to find a winning formula. In terms of creating chances and getting the crosses in we don't have a problem but that formula in terms of scoring goals is just not there. Maybe a bit of that is in the head. "You can only do it by hard work in training and hard work on the pitch. "We need to finish the chances but then we all know what's wrong. You don't need to be a Uefa qualified pro to see that. We'll put it right." "There has been a lot of work put in over the last week, I thought the shape and organisation of the team was different class. "They showed again today that they are willing to work hard as a unit. "I have always known Yoann (Folly) has had the ability and he showed today how influential he can be." 90:00+6:57 The referee blows for the end of the match. 90:00+5:15 The ball is sent over by Adam Johnson. 90:00+3:48 Mark Yeates takes a shot. 90:00+3:08 The ball is sent over by Adam Johnson, Yoann Folly makes a clearance. 90:00+2:35 Ashley Barnes concedes a free kick for a foul on Jonathan Grounds. Free kick taken by Brad Jones. 90:00+1:10 The ball is crossed by Adam Johnson. 90:00+0:59 Mark Yeates produces a cross, clearance made by Shane Lowry. 89:34 Chris Clark gives away a free kick for an unfair challenge on Mark Yeates. Direct free kick taken by Gary O'Neil. 87:57 The ball is swung over by Adam Johnson. The ball is crossed by Rhys Williams, Marcus Bent takes a shot. Save by Romain Larrieu. 86:28 Substitution (Middlesbrough) makes a substitution, with Mark Yeates coming on for Julio Arca. 84:24 Inswinging corner taken by Adam Johnson, clearance made by Kari Arnason. 84:03 Jonathan Grounds sends in a cross. 82:56 Free kick awarded for a foul by Carl Fletcher on Gary O'Neil. Free kick taken by Gary O'Neil. 81:04 Julio Arca has an effort at goal from just outside the area which goes wide of the left-hand post. 80:32 Substitution Ashley Barnes is brought on as a substitute for Alan Gow. 80:03 Substitution Chris Clark comes on in place of Alan Judge. 79:51 Booking The referee cautions Carl Fletcher for dissent. 78:05 Penalty taken by Adam Johnson and missed. 78:05 Kari Arnason concedes a Penalty for a foul on Sean St. Ledger. 76:15 Shane Lowry challenges Leroy Lita unfairly and gives away a free kick. Adam Johnson takes the direct free kick. Gary O'Neil takes a shot. Alan Gow gets a block in. 74:29 Unfair challenge on Alan Judge by Jonathan Grounds results in a free kick. Free kick crossed by Alan Gow, clearance by Gary O'Neil. 72:09 The assistant referee flags for offside against Marcus Bent. Free kick taken by Romain Larrieu. 71:02 Justin Hoyte crosses the ball. 69:09 Alan Judge produces a cross, blocked by Jonathan Grounds. Corner taken by Alan Gow from the right by-line, Headed effort from inside the area by Kari Arnason misses to the left of the target. 67:46 David Gray gives away a free kick for an unfair challenge on Julio Arca. A cross is delivered by Adam Johnson, Gary O'Neil has an effort at goal from just inside the box that misses to the left of the goal. 67:27 Jonathan Grounds produces a cross. 66:05 Centre by Julio Arca, Headed effort from inside the penalty area by Marcus Bent misses to the right of the target. 63:51 GOAL - Jamie Mackie:Middlesbrough 0 - 1 Plymouth Goal scored by Jamie Mackie from deep inside the penalty area to the bottom right corner of the goal. 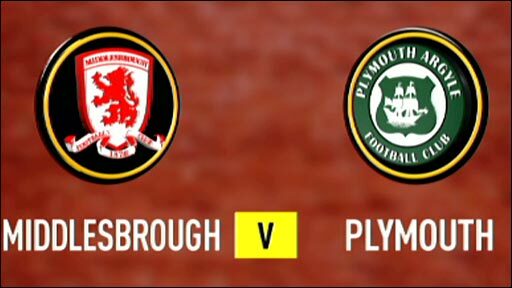 Middlesbrough 0-1 Plymouth. 63:25 Alan Judge challenges Adam Johnson unfairly and gives away a free kick. Free kick taken by Adam Johnson. 62:56 Unfair challenge on Alan Gow by David Wheater results in a free kick. Gary Sawyer takes the free kick. 62:41 The ball is delivered by Julio Arca, clearance made by Kari Arnason. 57:56 Jamie Mackie takes a shot. Save by Brad Jones. 57:24 Shot from just outside the box by Alan Gow misses to the right of the goal. 56:14 Adam Johnson has an effort from just inside the box that misses to the left of the goal. 53:22 Corner taken by Adam Johnson from the right by-line played to the near post, clearance by David Gray. 52:38 Foul by Marcus Bent on Karl Duguid, free kick awarded. Kari Arnason takes the free kick. 52:02 Substitution Jonathan Grounds comes on in place of Emanuel Pogatetz. 47:45 Julio Arca produces a cross. 46:52 David Gray gives away a free kick for an unfair challenge on Adam Johnson. Free kick crossed right-footed by Gary O'Neil, Yoann Folly makes a clearance. 45:48 Free kick awarded for an unfair challenge on Alan Gow by Gary O'Neil. Carl Fletcher delivers the ball from the free kick right-footed from right channel. 45:01 Substitution Marcus Bent on for Marvin Emnes. 45:00+1:16 The half-time whistle blows. 45:00+0:59 Effort from the edge of the area by Adam Johnson goes wide of the right-hand upright. 45:00+0:39 Emanuel Pogatetz fouled by Alan Gow, the ref awards a free kick. Free kick taken by Emanuel Pogatetz. 44:32 Inswinging corner taken from the right by-line by Adam Johnson. Correction - 44:07 Adam Johnson takes a shot. Kari Arnason gets a block in. 44:07 Adam Johnson takes a shot. Alan Judge gets a block in. 42:49 Gary Sawyer is adjudged to have handled the ball. Sean St. Ledger takes the free kick. 42:13 Adam Johnson sends in a cross, save by Romain Larrieu. 41:54 The ball is delivered by Emanuel Pogatetz, clearance by Kari Arnason. 41:06 Foul by Sean St. Ledger on Alan Gow, free kick awarded. Alan Judge delivers the ball from the free kick right-footed from left channel, save by Brad Jones. 38:17 The official flags Alan Gow offside. Sean St. Ledger takes the indirect free kick. 37:57 Leroy Lita takes a shot. Save made by Romain Larrieu. 37:10 The ball is delivered by Sean St. Ledger, Romain Larrieu makes a save. 36:35 Inswinging corner taken by Adam Johnson from the right by-line, save made by Romain Larrieu. 35:47 Gary Sawyer sends in a cross, Rhys Williams manages to make a clearance. Inswinging corner taken by Alan Judge, save made by Brad Jones. 33:53 Justin Hoyte crosses the ball, Romain Larrieu makes a save. 33:05 Karl Duguid takes a shot. Brad Jones makes a save. 32:14 Leroy Lita is ruled offside. Romain Larrieu restarts play with the free kick. 28:38 Alan Judge takes a shot. Save by Brad Jones. Inswinging corner taken left-footed by Alan Gow played to the near post, clearance made by Adam Johnson. Corner taken by Alan Gow from the right by-line, clearance by Leroy Lita. 27:32 Justin Hoyte delivers the ball, clearance by Shane Lowry. 27:16 A cross is delivered by Adam Johnson. 26:44 A cross is delivered by Adam Johnson, clearance made by Kari Arnason. 25:02 Gary O'Neil gives away a free kick for an unfair challenge on Alan Judge. Free kick taken by Carl Fletcher. 24:12 The referee blows for offside against Marvin Emnes. Gary Sawyer takes the free kick. 23:04 Leroy Lita is caught offside. Free kick taken by Kari Arnason. 22:21 Leroy Lita is flagged offside by the assistant referee. Romain Larrieu restarts play with the free kick. 21:31 Effort from the edge of the box by Alan Gow goes wide of the left-hand post. 20:47 Effort from the edge of the box by Karl Duguid goes wide of the right-hand upright. 19:32 David Gray delivers the ball, clearance by Justin Hoyte. 18:00 A cross is delivered by Justin Hoyte. Sean St. Ledger is ruled offside. Romain Larrieu takes the indirect free kick. 16:13 A cross is delivered by Justin Hoyte, clearance made by Gary Sawyer. 12:54 Unfair challenge on Marvin Emnes by Kari Arnason results in a free kick. Gary O'Neil takes the free kick. 12:04 A cross is delivered by Marvin Emnes, Carl Fletcher makes a clearance. 11:33 Marvin Emnes takes a shot. Kari Arnason gets a block in. 9:55 Julio Arca takes a shot. Shane Lowry gets a block in. 9:04 Corner taken right-footed by Gary O'Neil to the near post, Romain Larrieu makes a save. 2:54 Karl Duguid challenges Adam Johnson unfairly and gives away a free kick. Adam Johnson delivers the ball from the free kick left-footed from right channel. 2:14 Inswinging corner taken left-footed by Adam Johnson from the right by-line to the near post, clearance made by Gary Sawyer. Adam Johnson decides to take the corner short. 1:16 Alan Judge produces a right-footed shot from long distance which goes wide right of the goal. 0:39 Free kick awarded for an unfair challenge on Jamie Mackie by Sean St. Ledger. Alan Gow restarts play with the free kick.